Join us for 3 days of networking, events and keynotes. 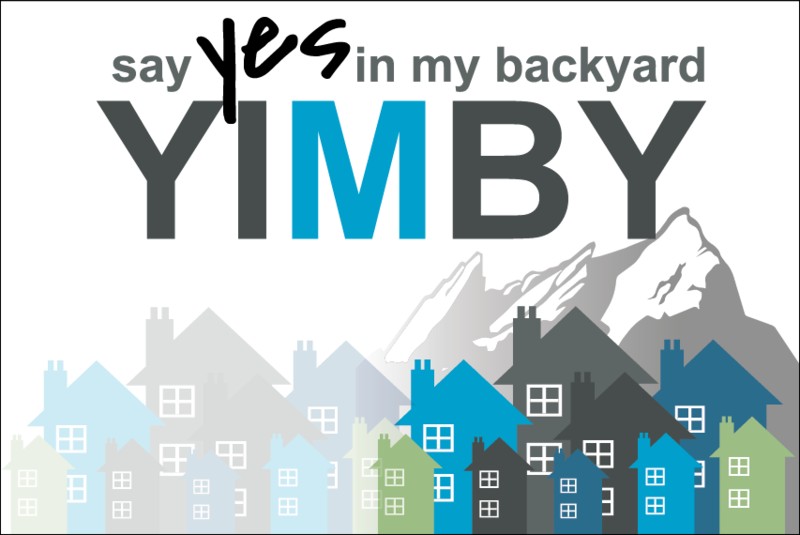 YIMBYs from all over North America are going to converge on Boulder, Colorado June 17-19, 2016! We’ll learn from each other and create connections to help move housing policy and sustainable urban infill in growing cities from NYC to Seattle, San Francisco to Austin, and everywhere in between. Join local members of Better Boulder, event organizers, and early arrivals for an informal happy hour, and get to know a few of the folks you’re going to be spending the weekend with. Location TBD. Morning: If you’re already in town, go for an early run or a hike, or have a leisurely brunch. We’ll eat lunch together at the Boulder Junction Hyatt Place, while Sonja Trauss of the San Francisco Bay Area Renters Federation (SFBARF) gets us fired up to change our cities for the better. 1:30 PM: Self organized peer learning session. We’ll break out into small facilitated round table discussions, on topics suggested by attendees and organizers — vote with your feet to find other folks interested in similar issues: e.g. defeating anti-housing ballot measures, transit accessibility of new development, how to form healthy alliances, legal challenges to exclusionary zoning, how parking requirements stymie new housing, how to make new urban density livable and friendly to people… and whatever else you suggest! We’ll take over the Sanitas Brewing Company patio, drink local beers and eat tacos while getting to know each other. We’ll have an Open Mic set up, and folks will be invited to show off their public hearing testimony skills… by telling the tale of their best (or most disastrous) civic engagement, in three minutes or less. Responding to anti-housing ballot measures. Forging healthy alliances between housing advocates and housing developers. How has Seattle gotten so much right with HALA? Together we’ll explore how increasing urban housing supply in livable neighborhoods, and creating great walkable, transit accessible cities can address two of the biggest issues facing our society today: increasing wealth inequality and climate change. Alex Steffen is an award winning writer with an ambitious, optimistic vision for economically vibrant, socially equitable, zero carbon cities. His 2012 book Carbon Zero: Imagining cities that can save the planet is an exploration of the kinds of design, technological and policy innovations that can transform our cities into low-carbon engines of prosperity. Sara Maxana has been a passionate advocate for Seattle’s Housing Affordability and Livability Agenda, and serves on the steering committee of its implementation effort, Seattle for Everyone. For her keynote, she will draw on her decade of smart growth advocacy in Seattle and collaborate with the Sightline Institute’s housing policy team to make the case that increased housing supply in growing cities is a vital cause for social progressives to champion. 12:00 Noon: What Then Must We Do? How do we keep our movement moving forward? What kinds of coordination should we have between different YIMBY groups across North America? How can we continue to learn from and support each other in this work? What resources do we have access to as a community? 1:30 PM: Go home! Or go play in the mountains! If you’re not heading home immediately after the conference, reach out to the local organizers and we can give you suggestions for awesome stuff to do in Colorado. Rocky Mountain National Park is just a little over an hour away by car… and there’s great rock climbing within walking distance of Boulder’s downtown. Please join us for the first North American YIMBY (Yes In My Back Yard!) gathering! It’ll be a great opportunity to network with other YIMBYs working on housing and sustainable urbanism, hailing from all across the US and Canada. Better Boulder is inviting activists, professionals, and academics to participate in a series of workshops, discussions and keynotes, focusing on peer to peer learning, and building a common understanding of housing affordability and sustainable urbanism issues facing desirable metropolitan areas.